Born in 1977. Started song writing during her university years. 2000 start performing at venues around Tokyo. 2002 independently released the first original album 『Traveler And Stranger』. 2005 relesed full album 『Seeds To Grow』 from Mule Records. Appeared in FUJI ROCK FESTIVAL’05, Avalon Field stage. 2006 performed at Hyde Park Music Festival 2006. 2009 released 2nd full album 『Beneath the Buttermilk Sky』 from Mule Records. 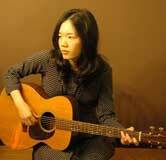 Appeared in FUJI ROCK FESTIVAL'09, Field of Heaven stage. 2011 released album 『Folklore Session』 as Lonesome Strings and Mari Nakamura from MIDI. Copyright (C) MOVING ON,INC. All Rights Reserved.